Buy a scarf to help save Rangers! Buy a scarf and help save Rangers! We are asking fans to commit just £10 by purchasing the limited edition Red and black scarf. All profits will go towards ensuring that Ibrox is full to capacity. This is a limited time offer.. All funds go towards the RFFF! We will spend all profits by Purchasing tickets and donations to the Rangers Fighting Fund. All funds raised will be used to purchase tickets for home games any additional cash will go directly to the Rangers Fighting Fund. Cash Payments Accepted Contact us! All profits from track and album sales from Itunes will go to help save Rangers. Help Rangers by buying our custom made scarf. All profits (over £7.50) will go to the club – Buy it now! 100% of the profits for this scarf will go to buying up tickets for Rangers’ home games giving our club much needed revenue! We will be giving the tickets away to children’s charities, schools, football clubs, BBs, etc. Any additional funds will go directly to Rangers Fighting Fund. In NO way will the Red and Black Scarf Campaign profit from this! Right now our great club needs to find some new revenue streams. Our aim to is sell our Red and Black scarf and divert all profits to buying tickets for future home games at Ibrox. All tickets purchased with will go to children’s charities, schools, football clubs, BBs, etc, to allow kids to visit Ibrox and enjoy a great day out. Any additional funds will go directly to Rangers Fighting Fund. We aim to deliver BEFORE every home or away game! 100% of the funds generated through the purchasing of the Red and Black scarves will go towards buying tickets for future home games. The tickets will then be given to children’s charities, schools, football clubs, BBs, etc, throughout Glasgow. ny surplus cash will be used to purchase Rising Star tickets at the last match of the season. The reasons for the colours Red and Black: It’s a deviation away from the traditional Rangers (Red, White & Blue) colours, however, we are still retaining a close link to the club: The Red and Black, as I’m sure you will already be aware of, is the traditional colours of our home socks. The colours are also represented in the ancient borough of Govan and will represent the unity and defiance amongst the fans that we have shown over the last few weeks. 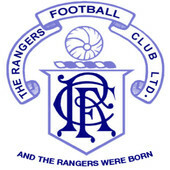 The Rangers reserve (or ‘A’) team – originally known as the Swifts – are Scotland’s most successful reserve team. Their colours were red and black vertical strips (ala AC Milan) which represented Govan.